The EG guideline for safety and health for employees on the workplace. Basis/effective: It is unique manufacture through static electricity ensure it is most effective antislip surfacing available. 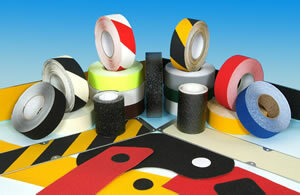 Colors: We can produce NonSlip tape to any color specification; all we need is a pantone match. Durability: Our product has a thick carrier impregnated with diamond hard aluminum oxide. Nothing is more hardy, though, durable and long lasting. Adhesive: All our products have a heavy coating of permanent pressure sensitive adhesive. Our unique adhesive is water resistant and ensures once it is down sit stays down! Resistance: NonSlip tape is solvent resistant. Suitability: NonSlip tape cones in a wide variety of grades including standard/coarse and aqua safe. Temperature: NonSlip tape can withstand above and beyond all environment limits, even surviving a temperature below 30° Celsius. Environmental Durability: It is durable mixture of aluminum oxide, thick plastic carrier and permanent adhesive allows for long and effective life. Cleaning: The NonSlip tape is formulated for resistance to both steam and detergent cleaning. Outdoor Type Abrasives Plastic Film Stairs or inclined ramp walkways of general & public buildings. Industrial Type Abrasives Aluminium sheeting Factory stairs, special vehicles, machinery equipments, ladders etc.